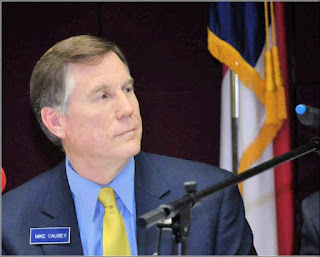 Nick Ochsner of the WBTV investigative team has revealed a planned lobbyist fundraiser for newly elected Insurance Commissioner Mike Causey, a fundraising reception hosted by a bail-bond-underwriting insurance company which is plainly an opportunity to get its snout into the trough early. North Carolina law governing political contributions prohibits corporations from contributing to or even supporting a political candidate’s campaign. Once this news was out, newly elected Insurance Commissioner Mike Causey is denying knowledge of the fundraiser, while the organizer says that Causey was in on it from the beginning. The emailed invitation, which went mainly to insurance lobbyists, touted that NC House Speaker Tim Moore would be in attendance (if anyone wanted to kiss an extra ring), and Tim Moore about as instantly said he wouldn't be there, said he didn't know a thing about it. In fact, Mike Causey now says he won't be there either, because -- oops! -- he just found another important meeting on his calendar. So it goes in Raleigh.